Are you a fan of Benefit Cosmetics? They haven’t been in Malaysia very long and can be found at Parkson Grand KLCC and Metrojaya MidValley amongst others. If you are familiar with this brand, you’d know its top sellers are BeneTint cheek tint, Dandelion and Georgia blushes and Boi-Ing concealer, just to name a few. Their packaging is cute and girly which appeal to many. You’d be interested to know that the prices in Malaysia are actually very much marked up. It may be something to do with the conversion rate or the cost involved in bringing in the brand. But, I found the prices too high. e.g. Dandelion blush costs RM129 (US$37.63) whereas it only costs US$26 in the USA. A Chanel blush costs RM133 and to me, the quality of Chanel is better. Anyway, if you know what you want or want to try out at the counter first then buy online, Benefit Cosmetics online is having a promotion for FREE SHIPPING for international customers with purchase of US$85 or more. And you’ll get 2 free samples too. Use the code INTLFRSH at checkout. So, grab your buddies and convince them to try Benefit so you can all chip in and share. It’ll cost you less in the long run buying online than buying in Malaysia. I don’t know how long the promo is for though so check the site out if you want more info. p/s I don’t get paid for this and this info is based on an email I received from Benefit 🙂 Enjoy! NEXT POST: Skinny jeans are OUT! I love the Benetint and I use it on a daily basis. It’s so easy to use and I also paint it on my lips and it’s a non smudge lip color that is very natural. Love it, Love it, Love it. Does singapore sell benefit cosmetics? I’ve went to tangs and isetan but I can’t seem to find them. Maybe I’m not looking hard enough. Does anyone know whether we have to pay for import duties and tax on buying the benefit cosmectic products from the US online from Malaysia ? Hi Charlene, I’ve never been taxed and neither have my friends when we share orders. Happy shopping! I love the new sugarbomb face powder and the one hot minute face powder from Benefit, and also the all time favourite, Dr Feel Good ! There is currently a free international shipping offer for all USD115 purchase online. There usually is free international shipping if you can hit certain targets which change from time to time. US$115 is the usual threshold for now. I love Benefit Sugarbomb too! why i can’t find “do it daily! moisturizer” here..
Yea, i love that “do it daily” moisturizer too! checked in klcc parkson, they said they weren’t stocked with this for some time! but u can get it from the benefit US website. I wanted to buy from online… but it doesn’t seem to have the free shipping promo 🙁 anyone knows the promo code number? also, it was rather weird that they ship everything else except TONER. they say delivery to malaysia is not included. @_@ I’m from Kota Kinabalu btw. 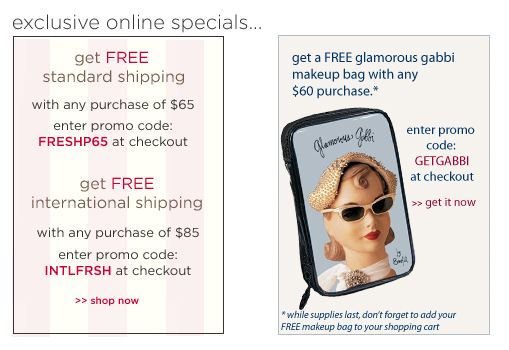 The latest free shipping offers are always stated on http://www.benefitcosmetics.com/gp/home.html and click on “Shipping Offers”. The free shipping promo code changes from time to time. There must be a reason they don’t ship toner – perhaps its because its so liquid and is liable to spillage. I have never had problems with regular makeup.